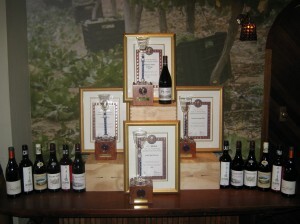 PINOTAGE POWER – FAIRVIEW PRIMO 2009 snatches another prestigious award. | Welcome to Fairview's Blog! 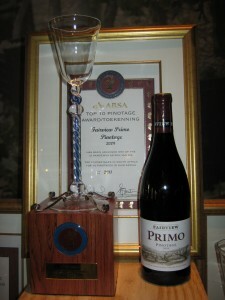 PINOTAGE POWER – FAIRVIEW PRIMO 2009 snatches another prestigious award. Fairview have consistently been in the Absa top 10 over the years. Our first award being that of the Spice Route 2003 in the 2004 competition. More recently the Fairview Primo Pinotage 2007 was awarded the honours in the 2008 competition, Fairview Pinotage 2009 in the 2010 awards. And this year the Fairview Primo 2009 has captured the hearts (and taste buds) of the judges. The Deep red colour with purple touches. Intense cherry and perfumed violet on the nose, with underlying notes of smoky oak and sweet spice. Ripe plum and spice on the palate with a firm structure worthy of time in the bottle. This wine will only get better with time. A definite must for any cellar. We are extremely proud of our Pinotages and rightfully so, as Charles has spent a large part of his life in pursuit of locations that express the uniqueness and show-stopping ability of this varietal. During his travels, he have found many beautiful and unusual vineyard settings. Primo Pinotage is our selection of the finest wine of the vintage, selected from sites that allow the varietal to find its true expression.